Ok, maybe I took that a little too far. The point is, I love wintery food. And there’s nothing that says winter to me like butternut squash. Throw some tofu, kale, and potatoes in there and you have an amazing one-pot meal that is guaranteed to make you want to throw another log on the fire and happily curl up for three months. What makes this dish so special is the ingenious pairing of the miso and the curry. One of my all-time inspirations, Heidi Swanson of 101 Cookbooks, calls it “over-the-top delicious,” and she’s right on. The miso enhances everything with this deeply savory, can’t-quite-put-your-finger-on-it flavor, and the curry adds just the right amount of spice. And the pop of lemon juice at the end is truly visionary. Let’s not forget about the perfect little toasted pumpkin seeds for crunch, and the depth of flavor from the bright green cilantro. It’s so simple, and so unbelievably good. Did I mention this is a one-pot meal? If I haven’t sold you on it already, picture this: it will take you less than an hour to get it on the table. The only time-consuming part is peeling the squash. In Swanson’s “Super Natural Everyday”, she uses delicata squash, which would also probably be amazing. I could not find it around here, so I used butternut instead. I find peeling squash to be meditative and relaxing, but if it makes you want to start peeling your eyeballs (ew), most grocery stores carry packages of ready-to-heat, chopped squash. Grab one of those and in the time it takes you to preheat the oven you’ll be ready to go. I made this last night for a potluck, at which I met many of Ryan’s classmates. Suffice it to say they were all incredibly gracious, intelligent, and hilarious (making them perfect dinner companions), and I am very grateful I was able to test the dish on such discerning (and hungry) individuals. In my haste to make sure we weren’t extra-fashionably late, I neglected to take a better picture of the final product, so this iPhone photo will have to suffice. Look at those colors, though! *Note: When it comes to the miso and the curry, don’t overdo it. A little goes a long way. Make sure you get extra-firm tofu, otherwise it will fall apart in the oven. The only thing I’ll say about the taters is that it’s important you cut the chunks into the same size or smaller than the squash. Their roasting time is a bit longer than the softer squash and you want it all the be done at the same time. You can find many versions of the original recipe online, but if you have the means, I highly recommend getting the whole cookbook, Super Natural Every Day. I use it, well, almost every day! 1. 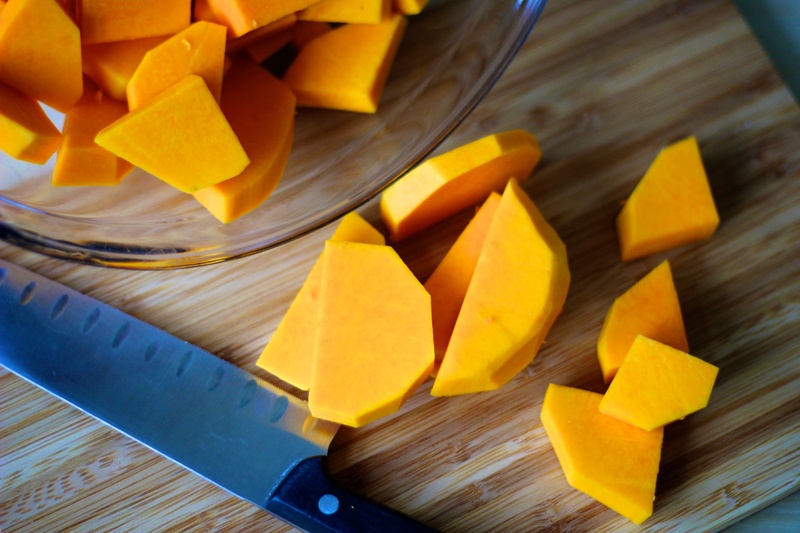 (If your squash is already peeled and sliced, move on to step 2.) Slice the ends off your squash. Cut the butternut squash in half, separating the bulbous end from the longer end. Stand one half up on your cutting board, flat cut side down. Using a medium knife (and lots of caution), slice the peel off in strips. Once both pieces are peeled, cut each in half lengthwise. The bulbous end should be scooped out so no seeds remain. Now, slice the peeled squash into 1/2 inch thick half moons, and then halve these pieces again into pie-piece shaped sections. 2. 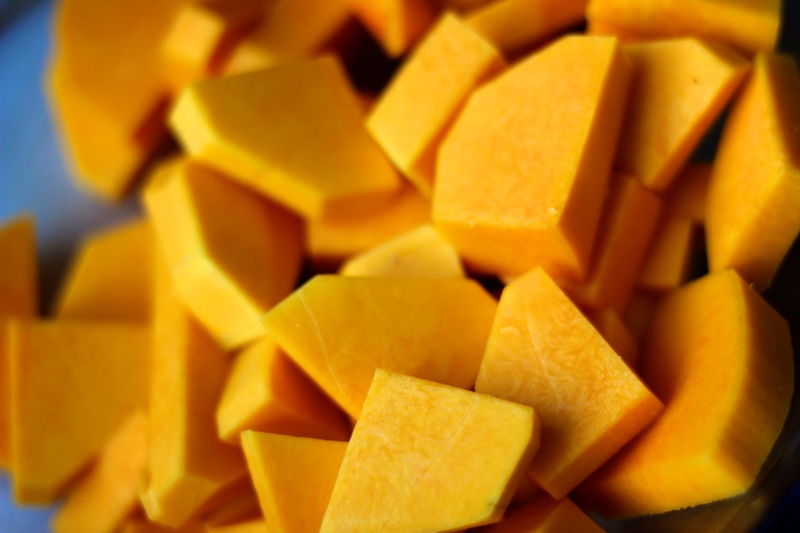 Place your oven rack in the center of the oven and preheat to 400 degrees F. If you haven’t already, make sure your squash is cut into 1/2 inch thick chunks. In a medium bowl, whisk together the olive oil, miso, and curry paste. Combine 1/3 cup of this mixture with the tofu, potatoes, and squash in a bigger bowl. Use your hands to mix it well, turn it onto your rimmed baking sheet and arrange in a single layer. 3. Roast for 25-30 minutes, until everything is tender and browned. Gently toss every ten minutes or so to loosen up anything that’s sticking. As you get toward the end of the cooking time, keep an eye on your pan; things can go from browned to burned in a flash. 4. 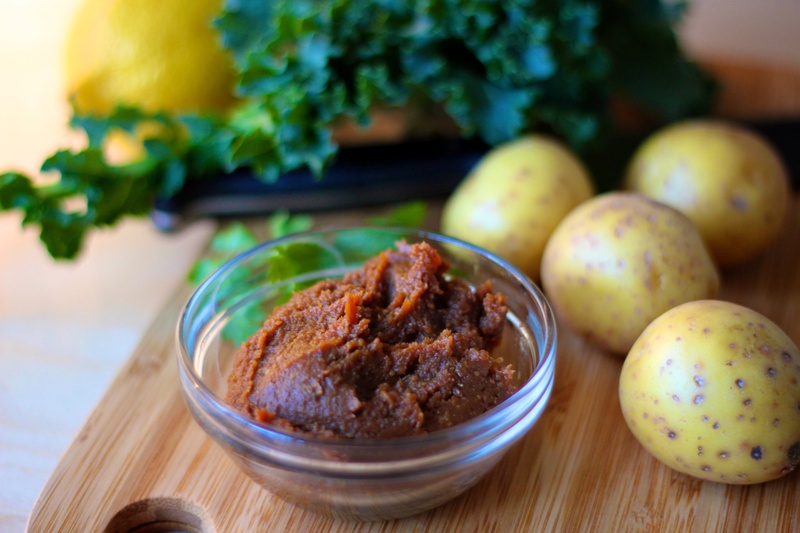 Meanwhile, whisk the lemon juice into the remaining miso-curry paste and stir in the chopped kale until coated. 5. You’ll know the veggies & tofu are done when you can pierce the potatoes with a fork easily. Let them cool for just a minute or two and then toss them with the kale, cilantro, and pumpkin seeds. I like to save a few bigger sprigs of cilantro for the final garnish. Serve family style in a large bowl or on a platter. **To toast the pumpkin seeds: Place a large skillet over medium heat and add the raw seeds. As they heat up, the skins will split and pop. Shake the pan and stir it every minute, keeping a close eye on their color: they’re ready when a few start to brown and a toasty, nutty aroma rises from the pan. Shouldn’t take more than two or three minutes. 1) I love about anything with Kale in it. I think I’ll try making this sometime this week (if I can find miso anywhere around here). 2) It took me a little while to figure this recipe had ended. I think I was expecting soup or something. I’m not sure, and I’m just saying, I’m slow. 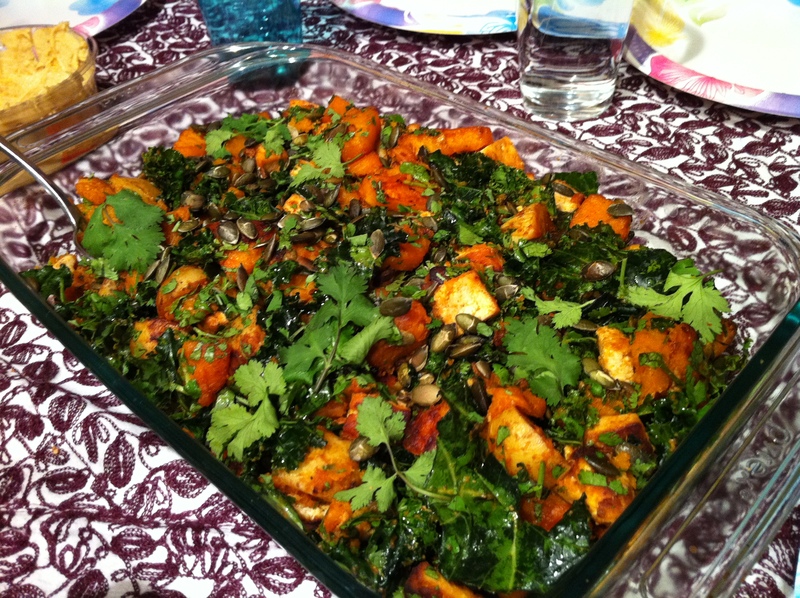 3) Try kale and butternut with carmelized onions and cranberry reduction on cornmeal pizza crust. It is heaven. Use smoked mozz. 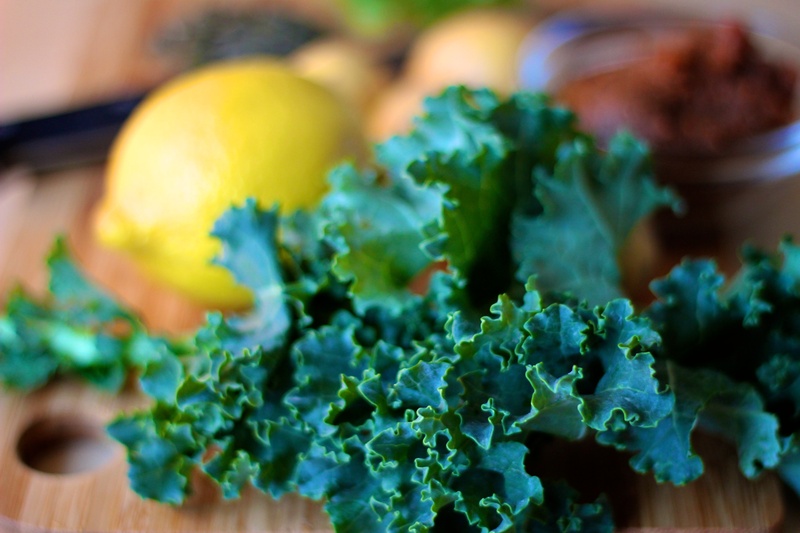 i eat kale at least three times a week if not more. i don’t care how it’s cooked. i will literally eat it straight out of the fridge sometimes.